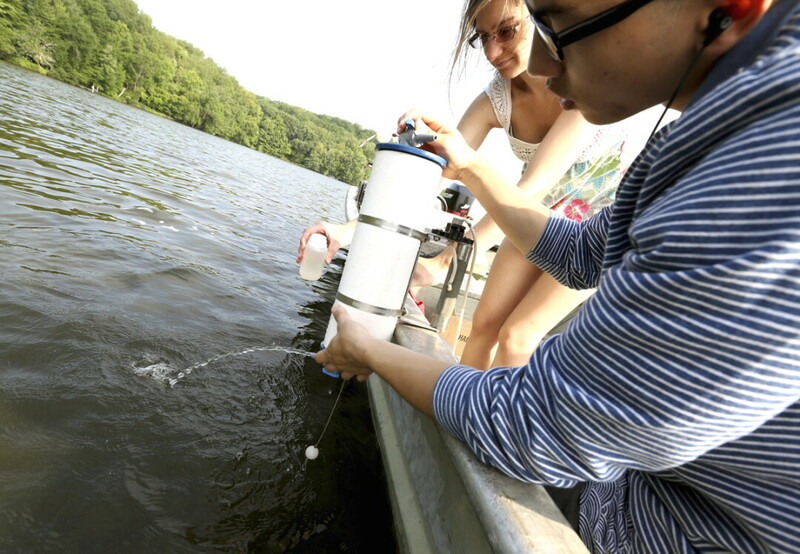 Students take a water sample from Lake Menomin during the 2014 program. Lake Menomin and the surrounding watershed are intertwined with the animals, farms, and people of Menomonie. Like so many Wisconsin communities, the city shares a geographic, social, and economic relationship with the local water resources. Unfortunately over time, elevated levels of phosphorus have led to overwhelming blue-green algae blooms in the lake each summer. The algae makes the water toxic to humans and other mammals. These blooms severely limit recreational activity in Menomonie and endanger the citizens, pets, and livestock in the area. 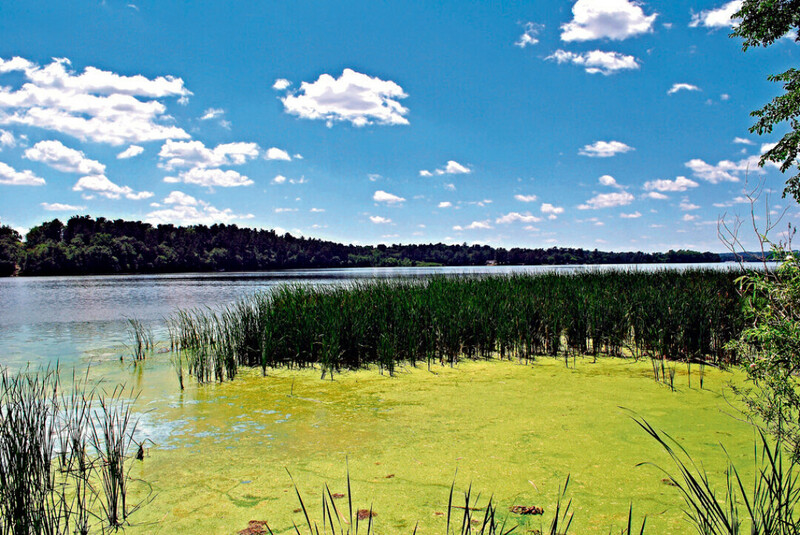 To once again have algae-free summers, the sources of the phosphorus pollution must be found and regulated. Luckily, a group of UW-Stout professors and undergraduate students from around the country are now working under a three-year grant from National Science Foundation to do just that. I chatted with Dr. Nels Paulson and Dr. Chris Ferguson, who lead the team that spans a broad range of academic fields and regional branches of government. Paulson brings a Ph.D. in sociology to the table while Ferguson has a doctorate in economics. Joining them are professors Tina Lee (cultural anthropology), Stephen Nold (microbiology), and Matt Kutcha (geology). The solutions to this and all environmental challenges require support and information from many disciplines. The success of this unique teaching method is easy to see with one look at the students’ weekly blog, “The Good, the Bad, and the Algae.” (lakes-reu.blogspot.com). The students – who come from as far away as California and North Carolina – are given a prompt each week for the blog. The topics include the concept of freedom, environmental justice, and social activism, just to name a few. “On the blog, we want the students to reflect on their work and experiences publicly to put it out into the world and connect to the community,” Paulson said. Slimy algae blooms are a common sight on the lake. Beyond the academic success, this REU is generating a public interest in the health of Lake Menomin not seen before. This is the second summer for the three-year grant, and last year the students and professors hosted an information and discussion session for area residents. “We want to show that this project is not just something we are doing behind the walls of UW-Stout. Last year we had a great dialogue at the event. The conversations fueled ideas outside of our research,” Paulson said. The enthusiasm has continued, Ferguson added. “We are getting the community to think about it a little more and the fatalism is turning around,” he said. A community event is planed again this year: All are welcome to come and share dialogue and ideas at 5pm Aug. 5 at The Raw Deal, 603 Broadway St. South, Menomoie. The future looks reasonably bright for the lake. Paulson, Ferguson, and the others recently finished an implementation plan, explaining how to reduce the manmade phosphorus levels going forward. These suggestions will eventually becoming policy designed to regulate the environmental impact of farming and other practices in the area. The professors also plan to seek a renewal of the grant next year. These are some of the first steps in a long journey. “It’s a little bit like chipping away at something you can’t see the end result of, but I think incremental change is possible,” Ferguson said. If the project succeeds, there will be a few more days of usable time on the water each summer and hopefully year down the road, a summer full of clear water activities. “I hope the town can take pride in the lake again,” he concluded. To learn more about the project, visit www.uwstout.edu/lakes/ or www.facebook.com/LAKESREU.